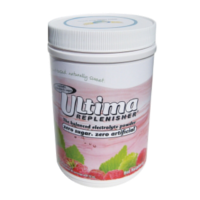 Ultima Replenisher is a 100% natural electrolyte drink that is so sweet and delicious, you won’t believe it’s sugar-free. Each serving contains real fruit flavors that are rich in antioxidants, plus 8 essential electrolytes and minerals for superior hydration. Unlike most sports drinks, Ultima Replenisher contains nothing artificial. It is low in calories, vegan, and gluten-free. Available in canisters and convenient single-serving packets.